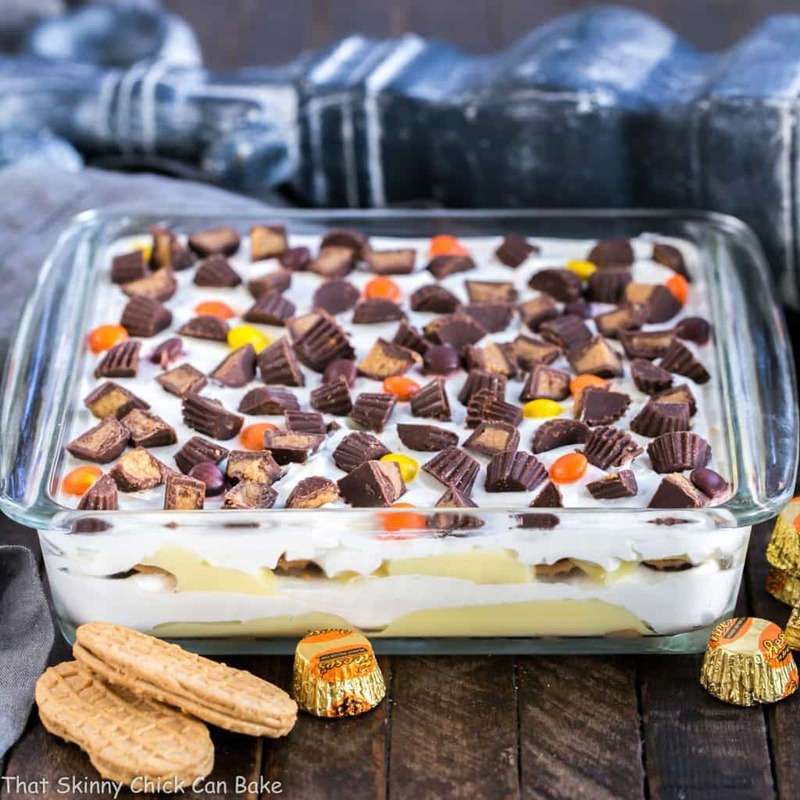 This incredible no-bake Peanut Butter Cookie Lasagna is layered with cookies, pudding, whipped cream, peanut butter cups and drizzled with melted peanut butter! 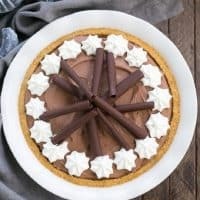 If you’re a fan of peanut butter desserts, you’ll swoon with every bite!! 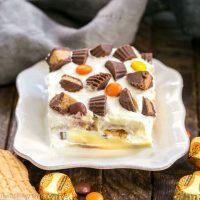 Much as I hate to admit it, I had no control around this incredibly decadent peanut butter lasagna! Thank goodness it was going to an event and my only temptation was the half slice that I reserved for Katie, plus the gooey knives and spatulas I used to cut this masterpiece into slices. I pretty much licked the pan and utensils clean after I hid the to-go platter in the fridge. I can’t say I wasn’t a little envious of those who were going to indulge that day! I am not a fan of straight up peanut butter, so I was a bit apprehensive about melting a half cup to drizzle between the layers. But, fear not, there was enough sweetness from the surrounding cookies and pudding to pacify my taste buds! This peanut butter cookie lasagna tasted amazing to say the least!! Note: If I was serving this at home, I’d just use a big serving spoon to dish this onto dessert plates! 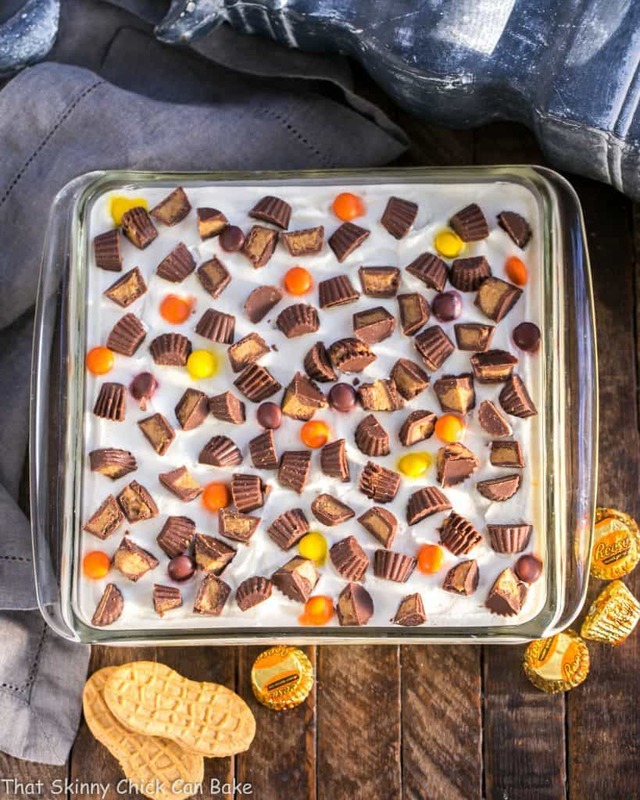 Reese’s Pieces and a couple sizes of peanut butter cups were in our pantry, so I chopped and sprinkled these over the top. 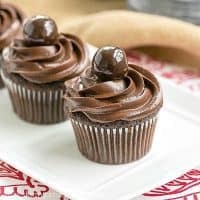 You can also drizzle some more peanut butter or crush some Nutter Butter cookies for a little crunch! This no-bake dessert lasagna will need to make an encore appearance in my kitchen. But next time, I’ll dish up a lady-like serving and eat it with a spoon (or fork) instead of off of a spatula! 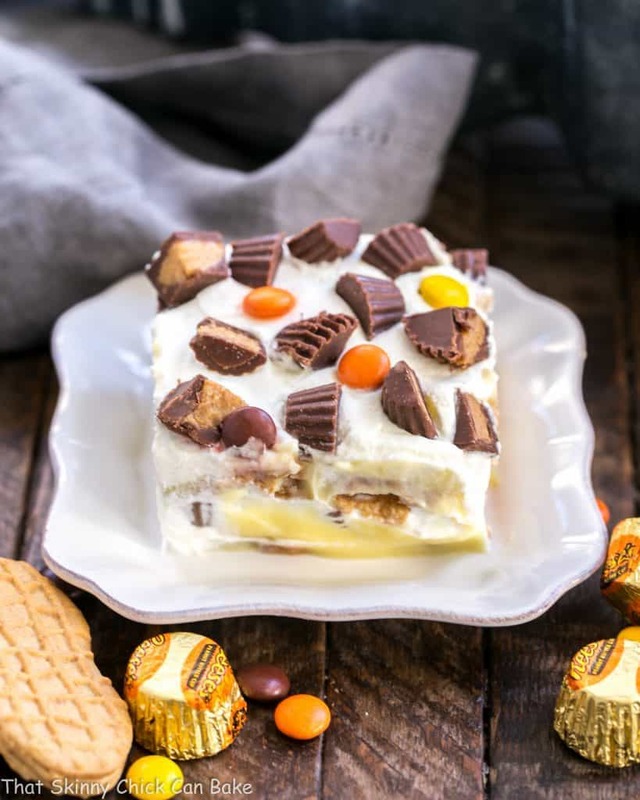 If you’re a peanut butter fan, you’ll definitely want to add this Peanut Butter Cookie Lasagna to your menu ASAP! 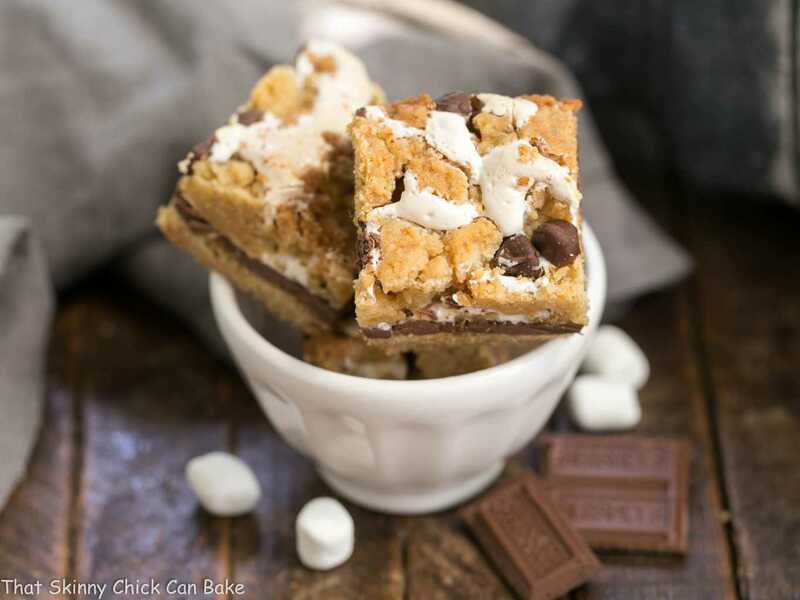 Check out Danielle’s take on this recipe as well as her social media sites! 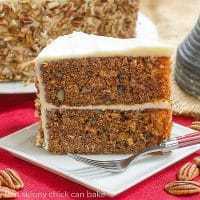 Plus make sure to stop by her blog and check out which of my recipes she made this month, too. A scrumptious no-bake recipe for peanut butter lovers! Line the bottom of an 8 x 8-inch pan with Nutter Butter Cookies. Drizzle about half of the melted peanut butter over the cookies. Spread half the pudding over the cookies and peanut butter. Whip the cream with the powdered sugar. 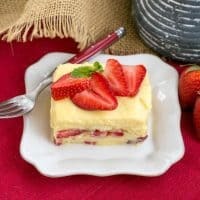 Spread half the cream over the pudding layer. 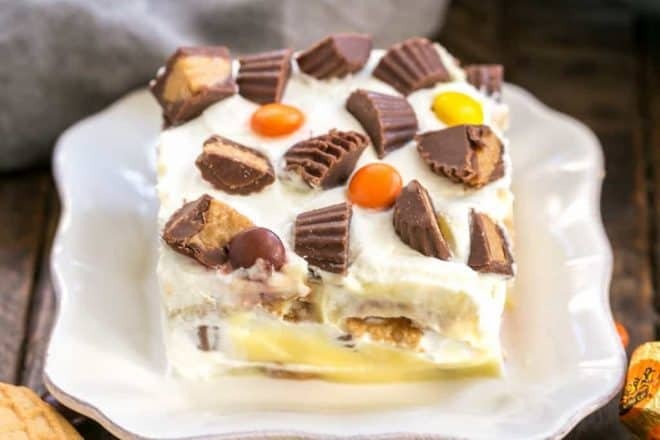 Repeat the layers, then garnish the top with crushed Nutter Butter Cookies, peanut butte cups, more peanut butter, and or Reese’s Pieces as desired. Chill 24 hours to allow the cookies to soften (that’s more than just overnight!). It’s worth the wait! All that and diet too?!?!?!? Oh… I was hoping it was a holiday miracle:@) This does sound amazing, I’m sure it would be a big hit here too! this looks great I am sure everyone will love this! Peanut butter is everyones fav here! Well, it’s a cookie and dessert season…so I am going to just indulge in this PB heaven! How fun! I know some little (and big) people who would go crazy over this! Well this certainly sounds like fun and would have been perfect for Halloween. With Thanksgiving next week and most of us ruining our diets this would definitely be a hit for young and old. Now that is one lasagne that no- one could resist. Yum! I could have this lasagna any day of the week. Looks so so amazing. THis is everything I’ve ever dreamed of in a dessert and then some. Seriously, PERFECTION! Cannot wait to try! OHHHHHHHHHHHH MYYYYYY GOSH! I legit have NO WORDS right now. NONE. ZERO. And THAT is a feat in itself!!!!!! Amazing dessert Liz, I would have a hard time not eating the whole thing myself as well. Love every component of this. I too would struggle to control myself around this delight. I would just dive straight in with a spoon and eat until the sugar coma kicked in!!! mmmmmm so peanut buttery and luscious! I’m swooning just looking at it! Since I’m the only peanut butter fan in the house a smaller version would be in order. 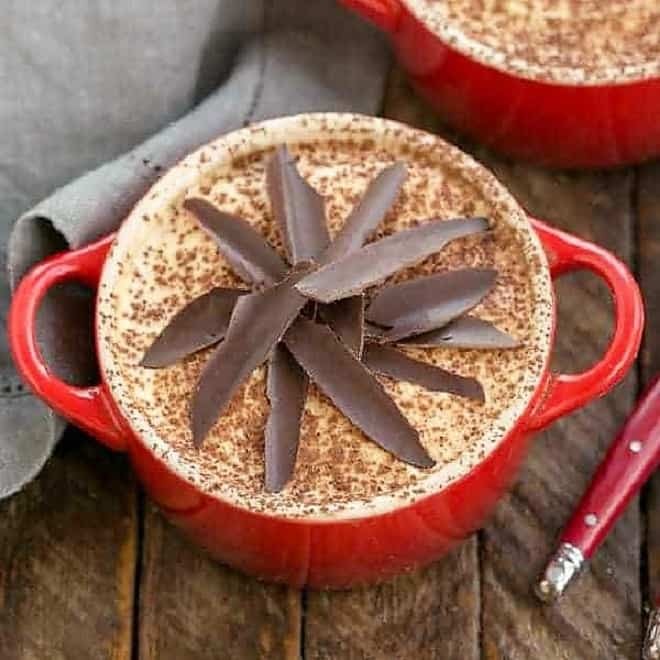 What a great fall dessert! Hello! 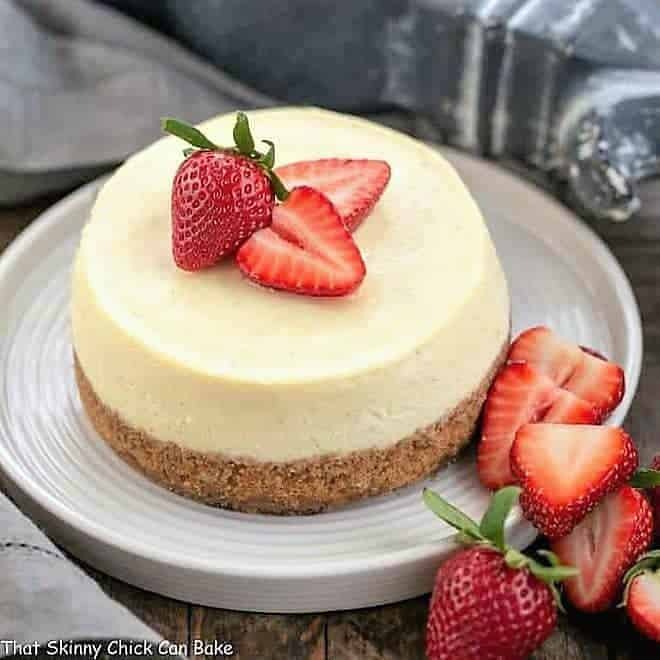 Thank you for the perfect recipe! It`s so beautiful! looks delicious love all the candy! that looks like something Antonio would love for sure!